Discussion in 'ESET Smart Security' started by Circumnavigate, May 18, 2012. My anti-virus is behaving very weird. 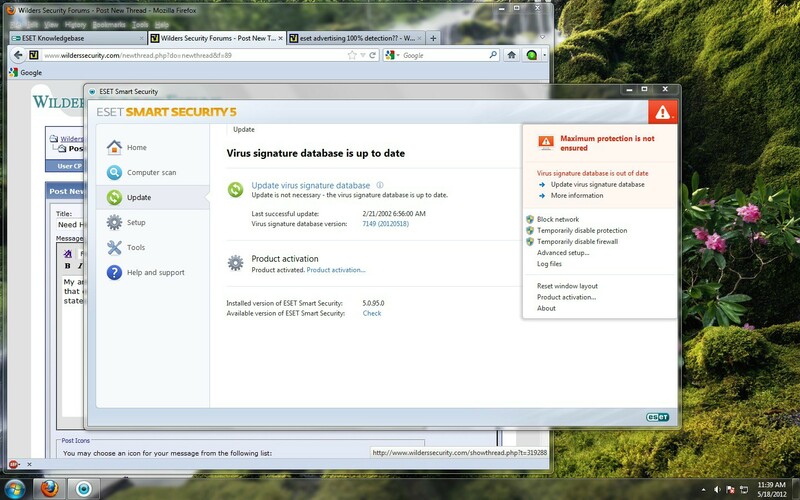 It states that the virus signature is out of that on the top right with the red exclamation point, but in the main window it states it is up to date with last update. Is there a virus on my computer causing this?? What should I do? When I try to update it downloads a vile called update.ver which is 7 from 0 KB? then nothing happens back to the same. Also it seems that it changed my system clock back to 2002? Edit I missed the screen shots you provided.That seems legit,perhaps Check your regional settings and time zones. ESET does not change the system date. Quite the contrary, a change in the system date must have caused the discrepancy you're seeing. Make sure that the system date is set correctly and then restart the computer.